Like all histories, the history of science has its fair share of ‘nearly-men’. They find themselves scattered amongst the heroes like Galileo, Newton, Darwin and Einstein. There’s Tycho Brahe, for example, the finest naked-eye astronomer of all time, who observed the motions of the planets with greater accuracy than anyone before him, but failed to realise – like Copernicus did – that the Earth was itself a planet, revolving around the Sun, and not the centre of the cosmos. Then there’s Joseph Priestley, the first man to ever isolate oxygen in an experiment, but did not recognise this “dephlogisticated air” as a newly-discovered element in the way that Antoine Lavoisier did, a man who Priestley had demonstrated the experiment to when the two men met in Paris in 1774. It is all too easy to come away from seeing this collection of breathtaking anatomical drawings by Leonardo da Vinci, centuries ahead of their time in their staggering level of detail and accuracy, feeling that had his three separate periods of intense study of the human body not each petered out for one reason or another (availability of corpses, painting and sculpture commissions, invasion of his home city of Milan, among others) he might have made the kind of scientific breakthrough that would have brought forward the dawning of modern medicine by at least 150 years. That, in other words, it was circumstances and ill-fortune that prevented Leonardo da Vinci from going down in history as one of the most important scientists ever. However, the history of science shows us that this is a far too simplistic view to take. For it is not one’s accuracy of observation or skill as an experimenter – which da Vinci had both of, in spades – that really matters. Nor is it a genuine desire to shed new light on a subject, or to solve a great mystery of nature that really matters (da Vinci sure had that too – his staggeringly ambitious ‘to-do’ list shows that there were a great many mysteries he was setting out to solve when he began his anatomical studies). What really matters is the ability – or perhaps imagination, or even good-luck – to make the kind of conceptual leap that enables you to interpret what you have seen in a way that no one else has done before. That is what Copernicus and Lavoisier did, using the same ‘observations’ that others before them had made. In the case of anatomy, it was the English physician William Harvey – a century and a half after da Vinci’s death – who made the breakthrough that finally overturned ancient Greek theories of the body and gave rise to the modern science of anatomy and of medicine, when he realised that blood circulated around the body. The fact that da Vinci studied the human heart for years and years, and recorded the major arteries and veins with a greater degree of accuracy and precision than even Harvey ever managed yet still never made this conceptual leap, strongly suggests that he never would have hit the nail on the head even if he’d had considerably longer to work on anatomy, or had any of his works on the subject been published. However strange it may seem that the British Royal family now owns this volume of work, the Queen’s Gallery, adjacent to Buckingham Palace, does serve as a perfect setting in which to showcase them. Rough sketches and handwriting they may be, but every care has been made to treat them like any of his great paintings would expect to be treated, with the added joy that many of the papers contain work on both sides, allowing you to walk around and re-examine them. The lighting, the colour of the walls (blood-red for the room containing the heart drawings), even the spacing between the works seems perfectly harmonious. The fact that one pays for a timed ticket definitely helps the visitor experience, allowing you to stand very close and peer at what are often very small and finely detailed drawings without someone else getting in your way (as was the case when I went to see the Royal Academy’s Van Gogh exhibition a couple of years ago, when we were all left scrapping like pigeons at a picnic to catch a few seconds’ glimpse of the fantastic but miniature letters the artist wrote to his brother, complete with tiny sketches of ideas for his next paintings). You can even take a mirror around with you to try to decipher the left-handed da Vinci’s incredible right-to-left ‘mirror’ handwriting. To a degree, the beauty of these drawings speaks for itself, but the voice of none other than Derek Jacobi is close at hand on the audio guide to talk you through them. There is also fascinating insight on the audio guide from medical professionals and anatomists praising the amazing accuracy and precision of da Vinci’s drawings (apparently some of his depictions of the heart and the major arteries and veins were only bettered in terms of accuracy with the development on modern scanning techniques in the twentieth century). I found it truly mind-blowing that someone could sketch such exquisite detail in three dimensions, such precise proportion and perspective, even ‘exploded views’ of body parts not dissimilar to what you would see in a biology textbook today, in what pretty much accounts for the late medieval period (Columbus hadn’t even set sail for America when the oldest of these drawings were made, in the 1480s). The exhibition runs chronologically, placing the sketches in an order that charts the trajectory of his thoughts. Each of the three rooms focuses on these three distinct periods of study, the first in Milan beginning about 1489, when he first set out his desire to, among other things, understand the nature of conception, how a fetus lives and develops in the womb, the source of human emotions, and the location of the soul. The ultimate aim was a ‘Treatise of Anatomy’, but in this first period of study – which ended around 1492 when he began work on The Last Supper – it appears he was mainly dissecting animals and not humans, as demonstrated by some largely speculative early sketches (like the study of the head, pictured above). Certainly by the time he resumed work in Florence some 15 years later he was able to access human corpses. The second room begins with a fascinating account of an autopsy he performed on a 100-year-old man. Contrary to popular myth, dissections, while relatively uncommon at this time, were not banned by the Catholic Church, and certainly by the time da Vinci was working at the University of Padua medical school -his third period of study- he had ready access to a steady stream of human corpses (around thirty or so, he noted, during the winter of 1510-11 alone). Certainly, as the exhibition demonstrates, he was using his study of the bones and muscles to inform his art, as were many Renaissance painters and sculptors as they sought to improve the realism of their depictions of the human form. 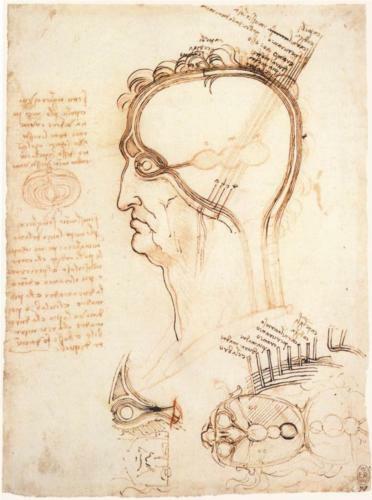 But da Vinci was also a man searching for new knowledge and new levels of understanding, not just of the shape and structure of the body, but about how it actually worked. It is this, ultimately, that sets him apart from anyone chopping up bodies in the late fifteenth and early sixteenth centuries. One only need compare his works in the first room of this exhibition to the third room to realise that while he began immersed in the long-established theoretical framework that had been handed down from Aristotle and Galen, his undeniably empirical – dare I say it, scientific – approach meant he very quickly began to move away from it. Nearly-man of science he may be, who died without any of the tasks on his ‘to-do’ list crossed off, but da Vinci’s anatomical work, in all its glorious beauty, scope and ambition, must surely sit alongside his greatest paintings as living testament to one of history’s true geniuses. 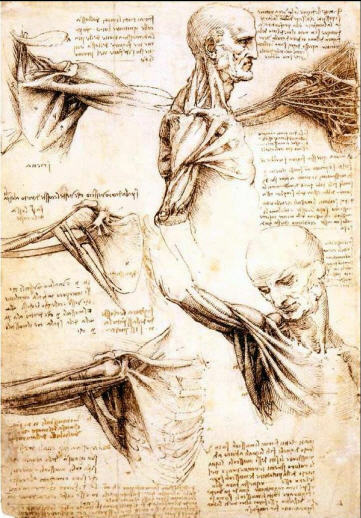 Leonardo da Vinci: Anatomist runs until 7th October at The Queen’s Gallery (buy tickets here). *It turns out, by the way, that upon the death of Leonardo da Vinci in 1519 his entire collection of manuscripts, notes, and sketches (on subjects ranging from botany to cartography, from mechanical inventions to depictions of the apocalypse) were inherited by his pupil Francesco Melzi, who lived with him in Amboise, France, where da Vinci spent his final years. Then, when Melzi died his family sold the papers to a sculptor, Pompeo Leoni, who arranged the papers into numerous volumes, one of which contained all of da Vinci’s works on anatomy. It was this volume that, upon the death of Leoni in Madrid in 1608, was eagerly snapped up by English aristocrat Lord Arundel. Finally at some point in the seventeenth century they were purchased by Charles II, an avid collector of art and other curiosities, quite possibly while he was living in exile on the Continent during the Cromwell regime. Narrowly escaping destruction in the Whitehall Palace fire of 1698, the da Vinci anatomical volume was stashed away in Windsor Castle for the next 200 years, until during the reign of Queen Victoria the drawings were carefully cut out from the book and at last published and exhibited for the first time. Tags: Anatomist, Anatomy, Aristotle, astronomer, blood, bodies, Catholic Church, Charles II, corpses, da Vinci Anatomist review, da Vinci review, Derek Jacobi, Dissection, Drawings, exhibition reviews london, exhibitions london, France, Galen, heart, History of Medicine, Leonardo da Vinci, Milan, Padua, painting, physician, Queen Victoria, Queen's Gallery, Royal Collection, science, scientist, the Last Supper, William Harvey, Windsor Castle. Bookmark the permalink. As far as I am concerned, this world will never again see the likes of da Vinci – beyond comparison.